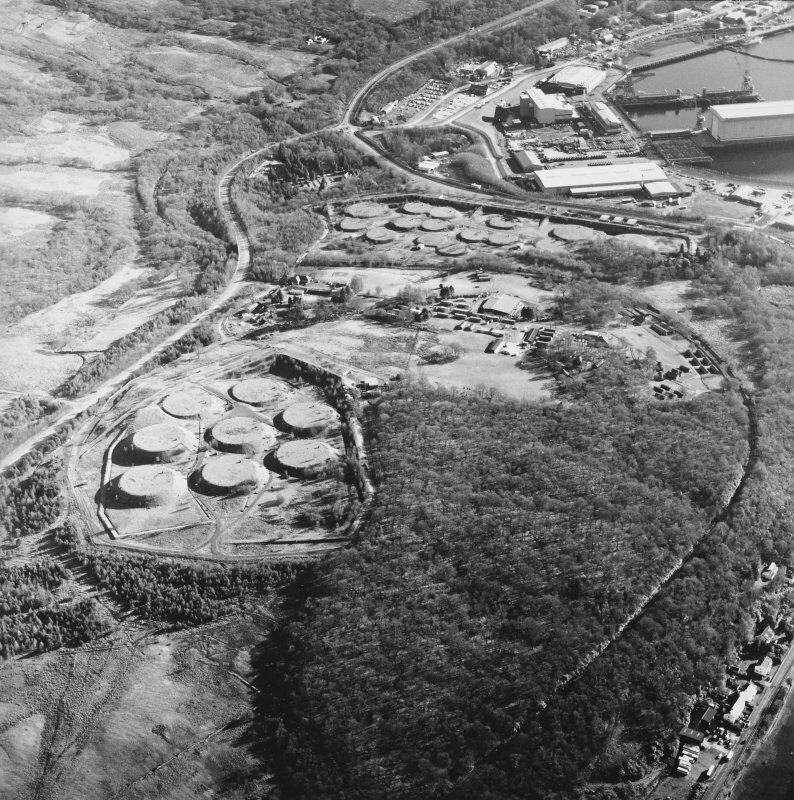 Oblique aerial view centred on the submarine base, taken from the SW.
Oblique aerial view centred on the submarine base with the military training camp and oil fuel depot adjacent, taken from the NNW. 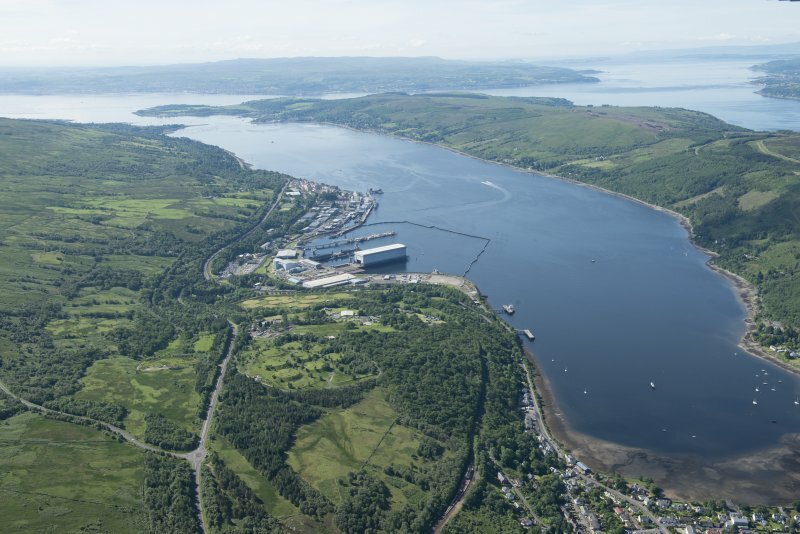 General oblique aerial view of the Clyde Submarine Base, Faslane, looking SW.
Oblique aerial view of the Clyde Submarine Base, Faslane, looking SW.
Oblique aerial view centred on the submarine base, taken from the SSE. 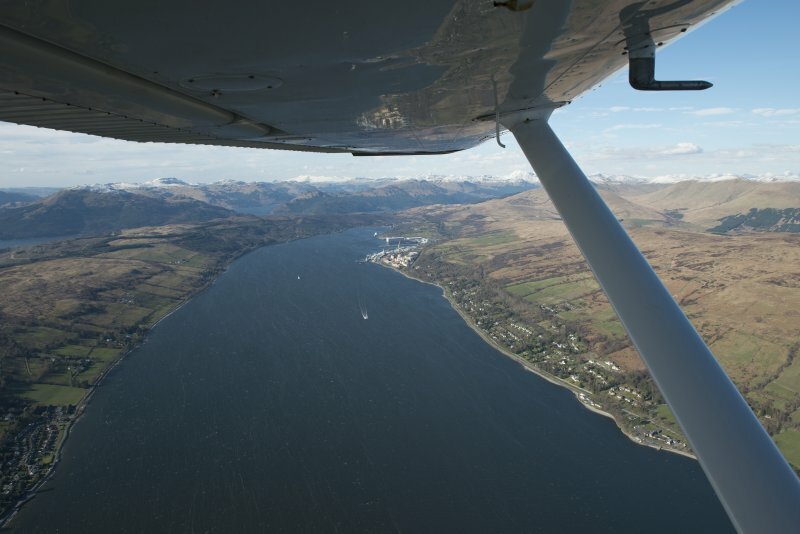 General oblique aerial view looking across the hill ground towards Gareloch, taken from the SE. 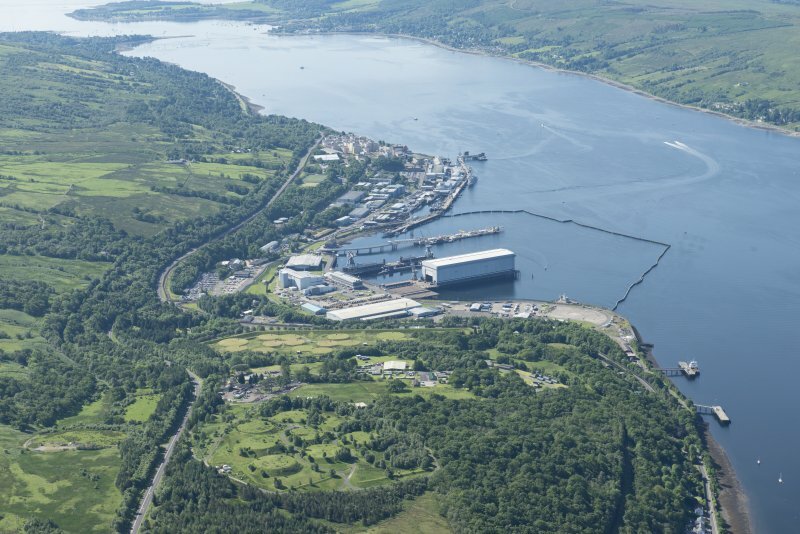 Oblique aerial view of Faslane Naval Base, looking to the N.
Oblique aerial view centred on the submarine base, taken from the ESE. 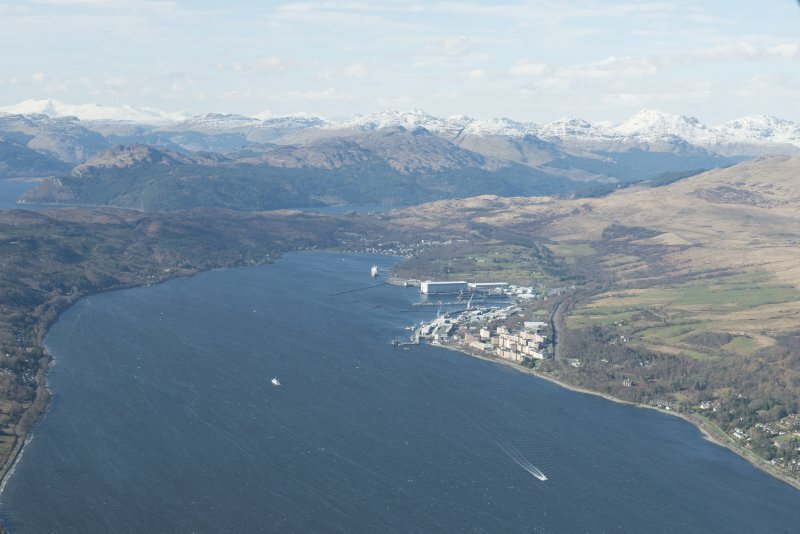 Oblique aerial view centred on the military training camp and oil fuel depots with the submarine base adjacent, taken from the NNW. 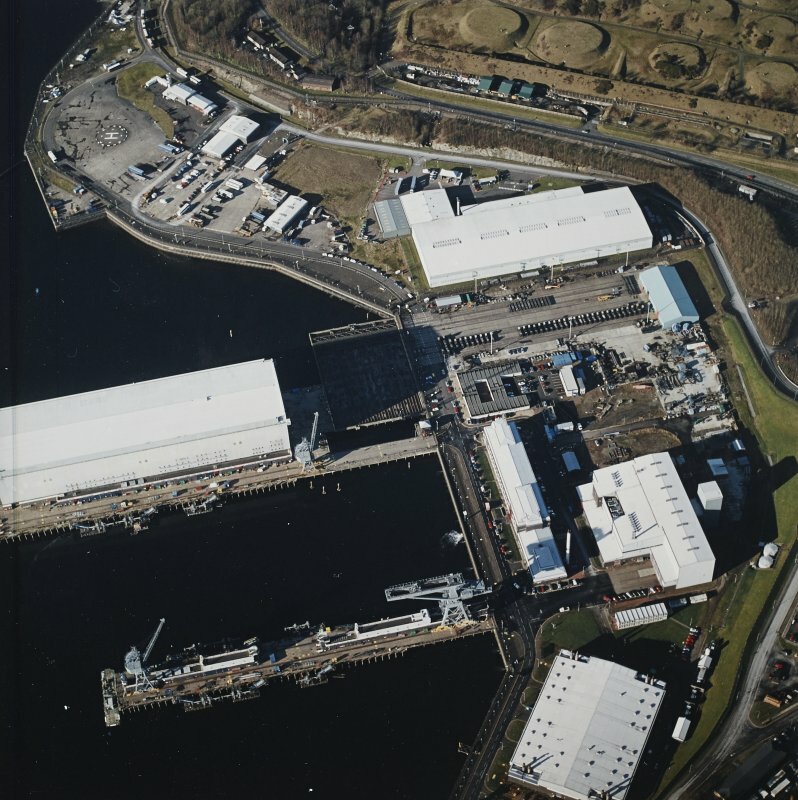 Oblique aerial view centred on the submarine base, taken from the WSW. For associated married quarters area (NS 24 88), see NS28NW 7. 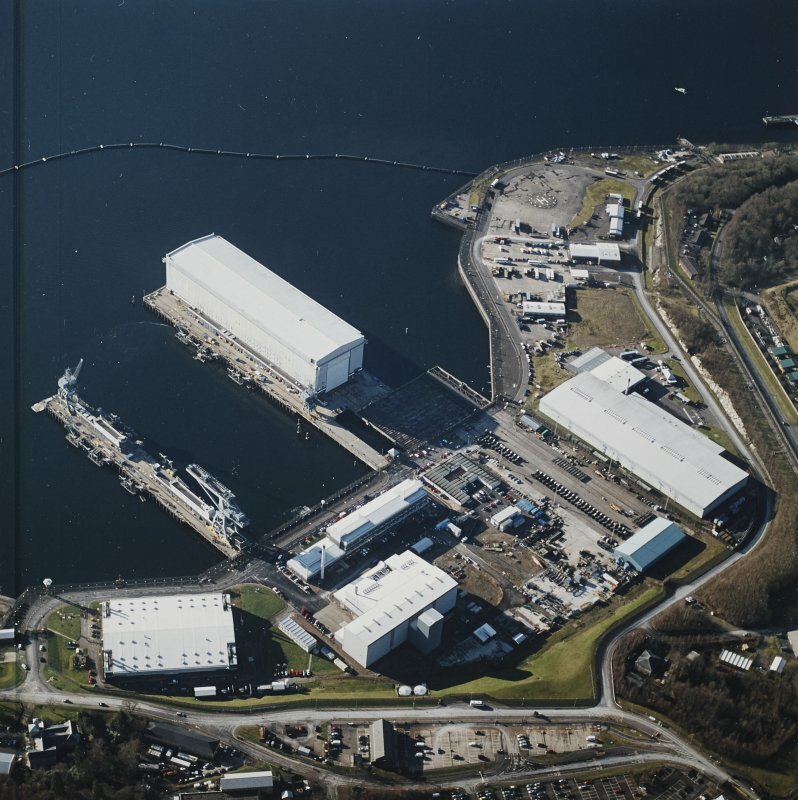 For related armament depot and jetty, see NS29NW 11 and NS29NE 11. 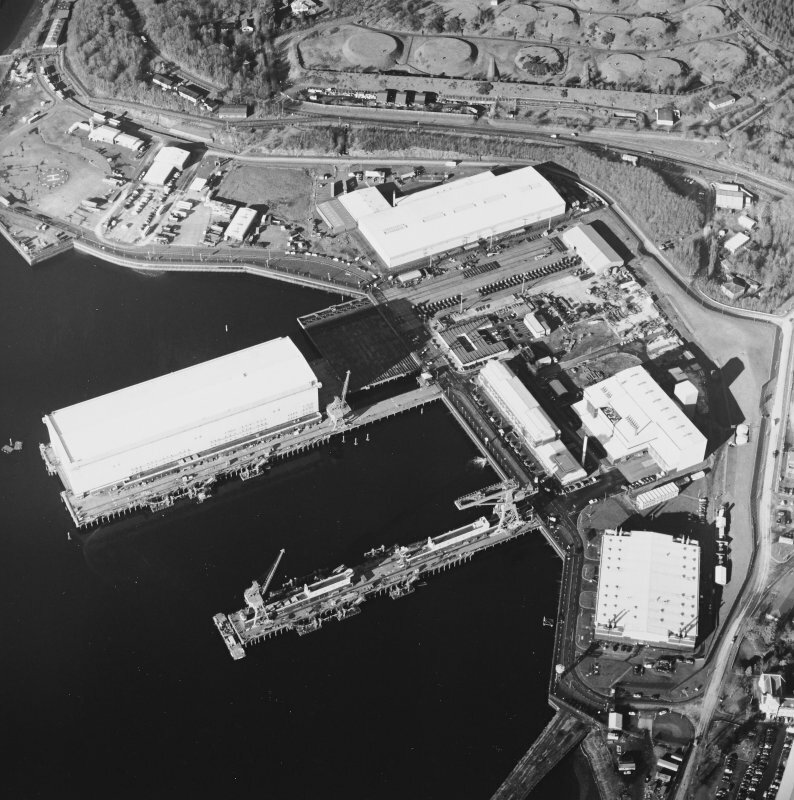 PSA Negs catalogued under: NS28NW 7 (Faslane & Coulport Married Quarters). Originally constructed during World War Two (WW II) as a deep water Emergency Port providing an alternative to Liverpool, Bristol and London. Remote from bombing raids, construction began during late 1940 not being ready until 1942. In April much of the northern part of the site was leased for shipbreaking to the Metal Industries Company and the Naval Port closed in 1946. In 1954 a shore support building for hydrogen peroxide type submarines testing was built, this structure still exists today, and was recently in use to supply power to the modern submarine fleet. 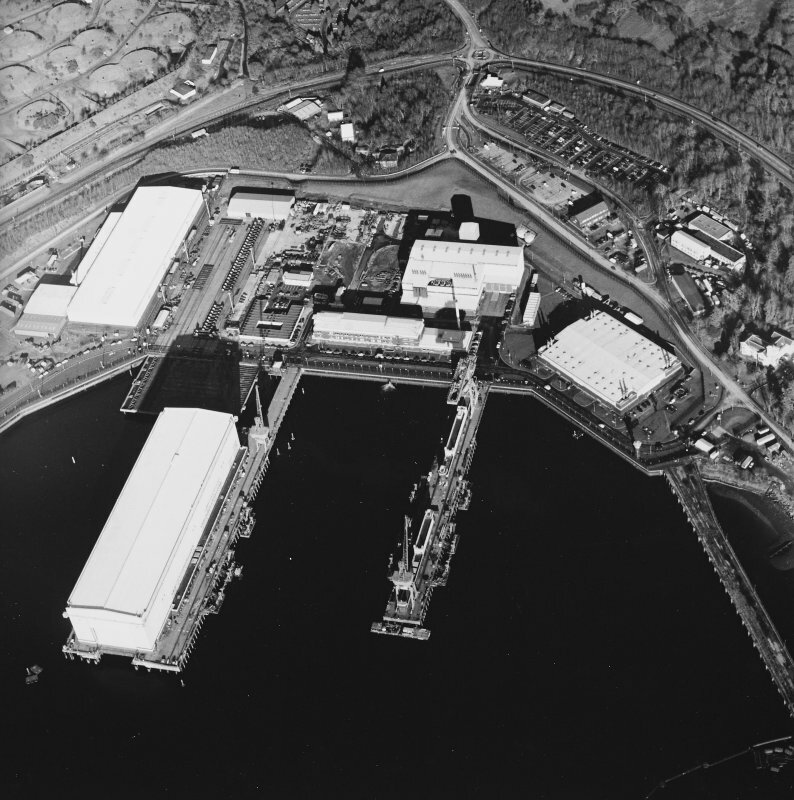 (1957, large Submarine Depot ships were based in the Loch in tandem with a floating dock. The floating Dock was sold in 1958 and Naval personell accommodated in various local 'houses'. 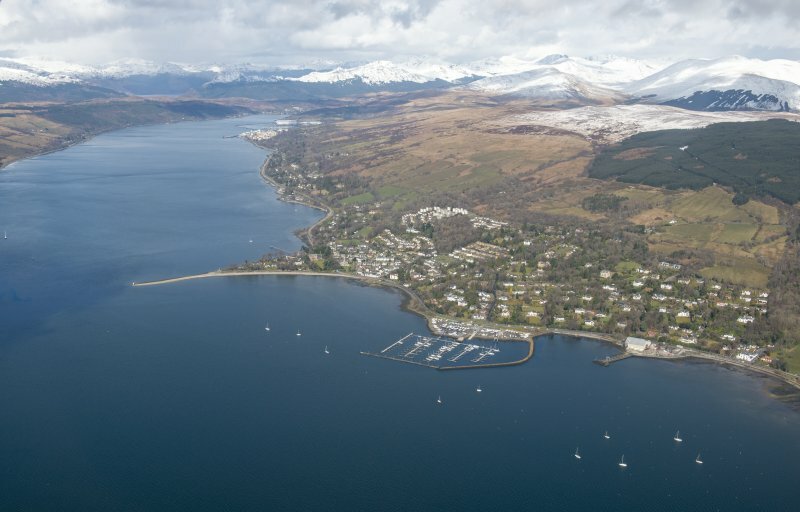 Subsequent to the late 1950's and after the establishment of the US Navy Nuclear Submarine Base in the Holy Loch, Faslane was chosen to house the new British Nuclear deterrent of Polaris Submarines. Following this, the shore establishment was built to support the nuclear submarine fleet, commencing in 1962. 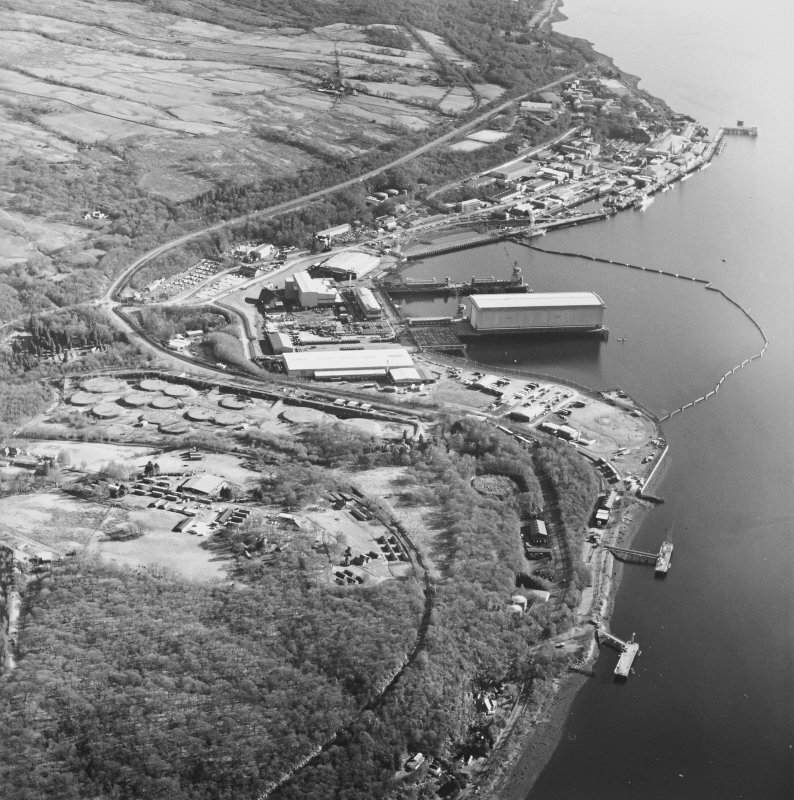 The N end of the former WW II continued in use for shipbreaking, but after the Ministry of Defence required more land for the base, it was taken over. 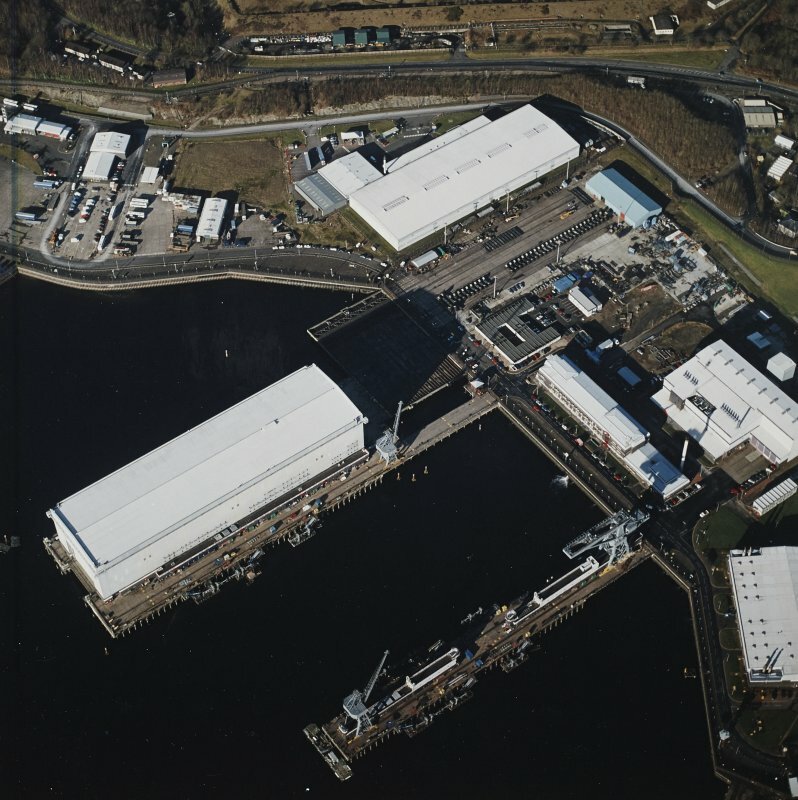 From 1962 onwards many barracks, buildings and structures were built to support the submarine base including a Polaris School, Sportsdome, Officers' and ratings accommodation, administrative blocks, mess and recreation blocks, an hospital, stores, power supply , married quarters and more recently in 1987 a 'shiplift' and 'finger jetty' capable of servicing the newer Vanguard class submarines. A new road by-pass has also been constructed on the E side of the site and a new road built through Glen Fruin. 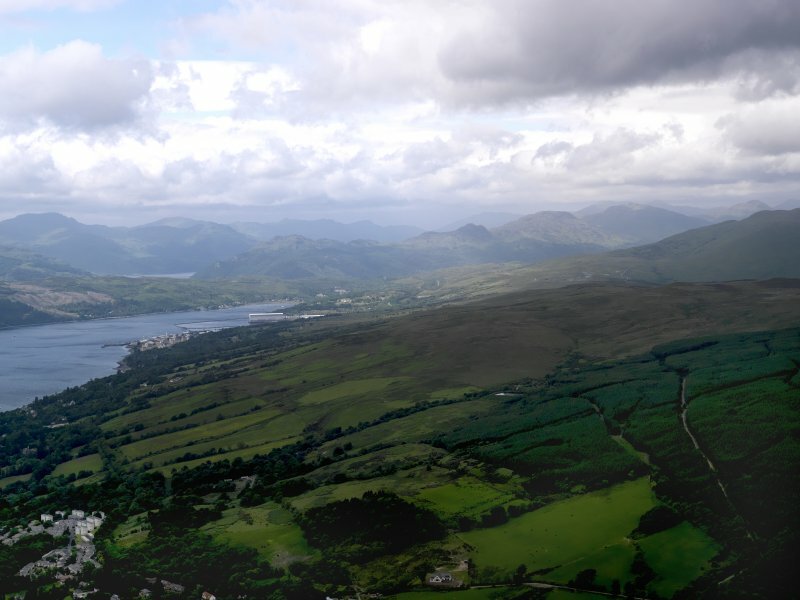 There was a Royal Navy presence in the Gare Loch during the First World War when the Shadon Hydro (ex West Shandon House, NS28NW 16), was taken over as a hospital.